A long-term project to dig up all available information on Dugway Proving Ground. DPG is a fairly secret facility located in the west desert of Utah. Its official mission is to evaluate, test, and develop biological and chemical agents for the US Army. UFOlogists have hinted that the base's secret status, underground facilities, and low profile make it the perfect place for sequestering of "alien artifacts" and other items of extraterrestrial origin. This claim is nearly impossible to verify given the secret nature of the installation and the dearth of publicly available information on the facility. The facility includes Michaels Air Force Base, an emergency landing facility for the space shuttle. This facility was to have been a test landing location for the X-33 advanced spacecraft. However that program was over budget, over schedule and eventually killed. Sgt. 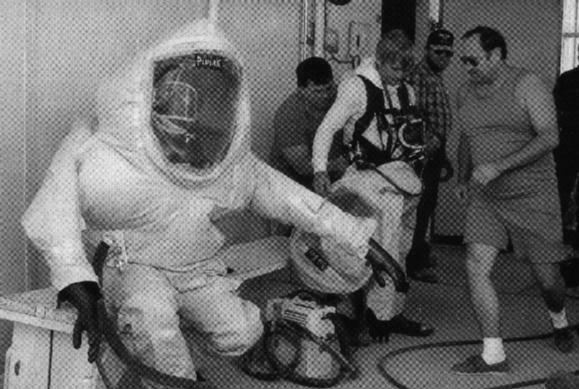 Ken Piniak wears a Self-contained Toxic Environment Protective Outfit during training at Dugway Proving Ground. -- SSgt. Joan K. Paine. Tom Spivey from Pine Bluff Arsenal dons another "STEPO" suit in the background. 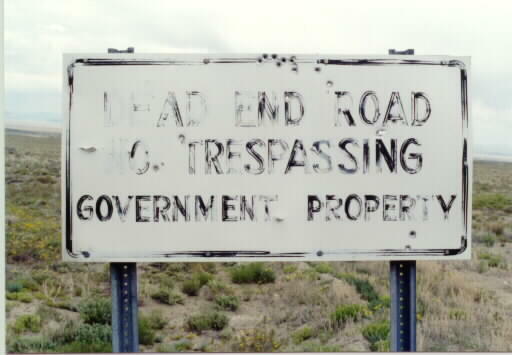 Sign at the head of a road leading into the bombing and gunnery range from the west side. The gunnery range is where various ordnance tests are performed as well as practice shooting. The gunnery range borders the proving grounds on its western perimeter. Formerly Used Defense Sites in Utah. There are several sites near or on Dugway Proving Grounds on this list. Major Range and Test Facility Base list, indicating Dugway and other bases. HiRes Fly's Eye Experiement located at the proving grounds.